Danielle Harris can’t possibly star in a bad slasher flick, right? 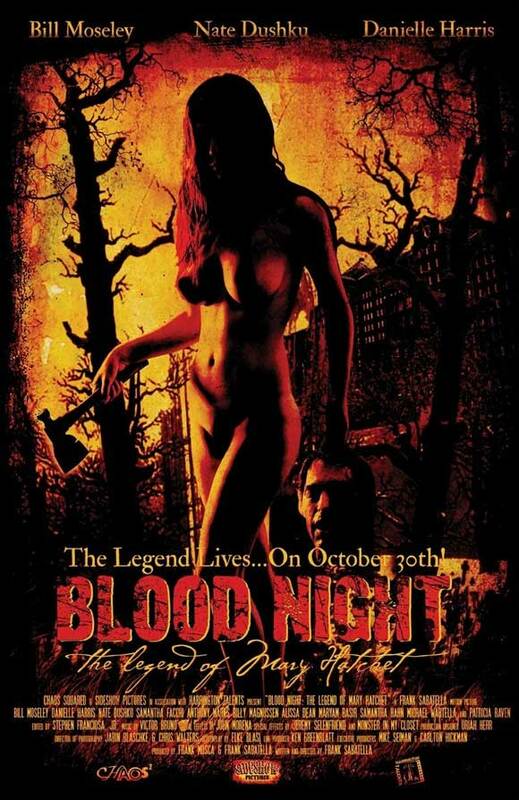 Turns out she can as I discovered “Blood Night.” What’s so bad about it? The awful characters and bad dialogue. Seriously, there are at LEAST 15 teens in this film and every single one of them is obnoxious beyond belief. Guys trying to score with girls, girls getting drunk and making out with other girls, guys fighting with other guys. Rinse. Repeat. There you have the first forty five minutes of “Blood Night”. It’s tedious beyond belief. When the deaths do start happening, the film is done in such a chaotic mess that it is hard to tell who is dying and how. It doesn’t help that there are at least a dozen too many characters. You don’t care about these people. They are assholes and most of them deserve to die in the bloodiest ways possible. Danielle Harris is in fine form here but she isn’t given anything to do until the last act, a last act that is utterly predictable. Still, this is a professionally made piece, some of the deaths are quite well done (loved the scissors through the back of the head and the “spaghetti intestines”) but in the end you really don’t care. Looking for some mindless gore? Have at it. Everyone else? Look elsewhere.